Summary: I designed this walk to Cnicht, otherwise known as the Matterhorn of Wales as an expedition with a difference. 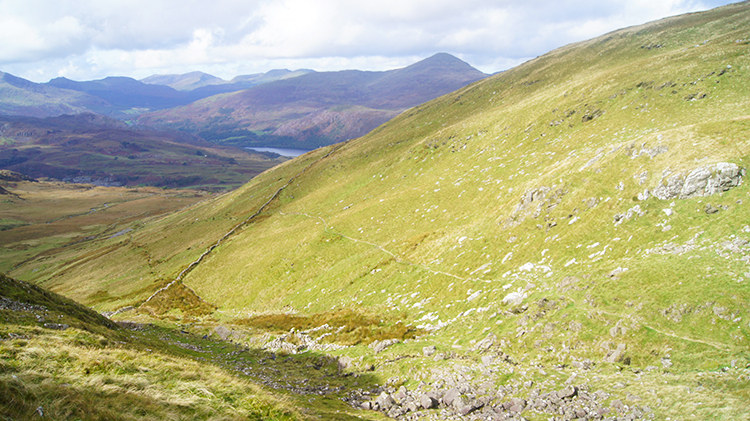 After climbing Cnicht I wanted to explore some of the less walked Snowdonia uplands. 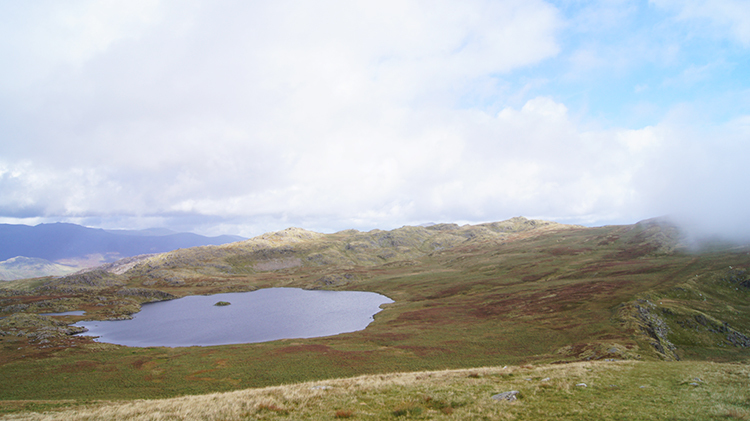 The vast swathe of country north of the mountain on an upland plateau of around 400 metres offered me that opportunity. Looking at the Ordnance Survey Explorer map it appeared that all I needed to do was follow a path north-east from Cnicht to Llyn yr Adar and then follow another path turning from north-west to south-west to Llyn Llagi. Thereafter I would need to follow a bearing south-west across Bwlch y Battel to rejoin my outbound line near the site of some disused levels and tips. Course plotted into my GPS, map and compass at hand too and I was on my way. I love Cwm Croesor. 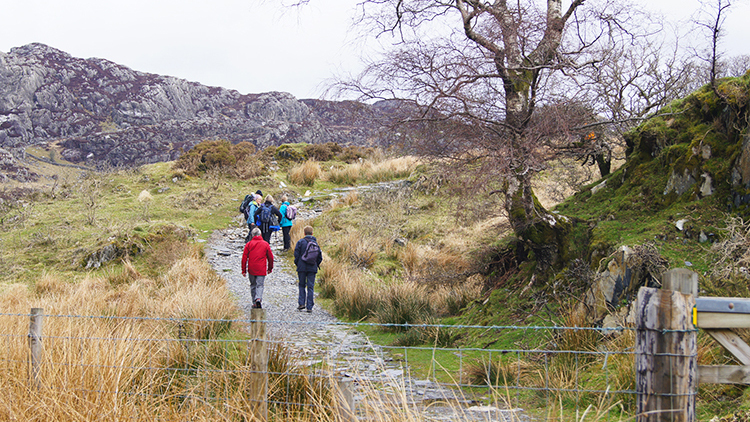 It is such a quiet part of Snowdonia, so different to the busy areas to the north and in particular around Snowdon, Beddgelert and Betws-y-Coed. If you want a day to get away from it all in the National Park then try here. You should not be disappointed. 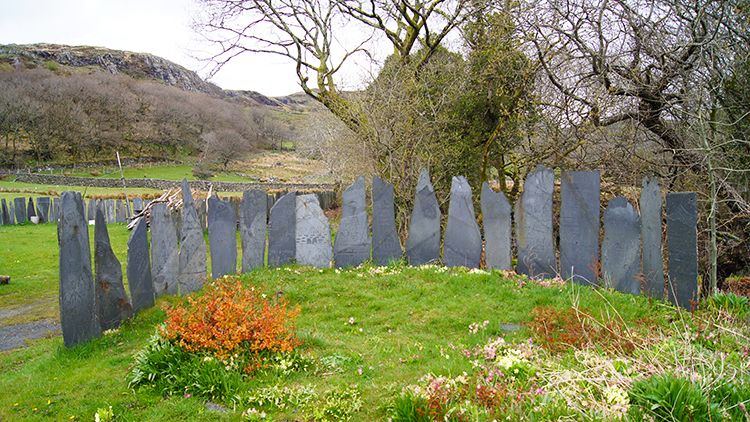 It was quiet when I drove into the valley from the north-west via Beddgelert, Pass of Aberglaslyn, Nantmor and Tan-lan. Admittedly it was only 9.00am when I reached the car park in the village but still I was the first vehicle to park up. Pen-y-Pass will have been busy. 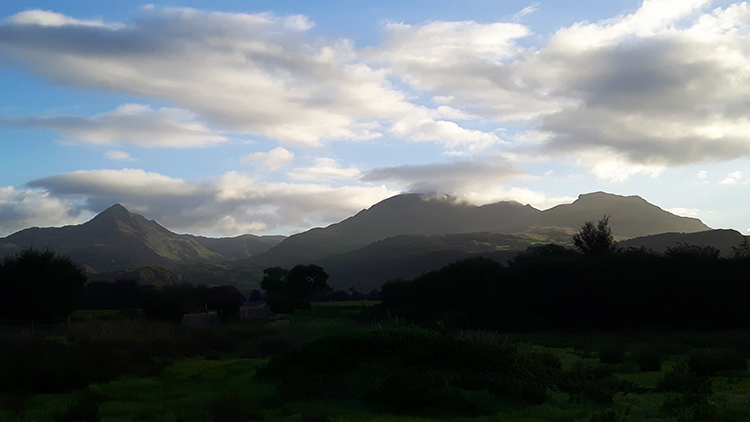 I set off from Croesor in a completely different direction to that which I had last time I had set off on a walk from the village. 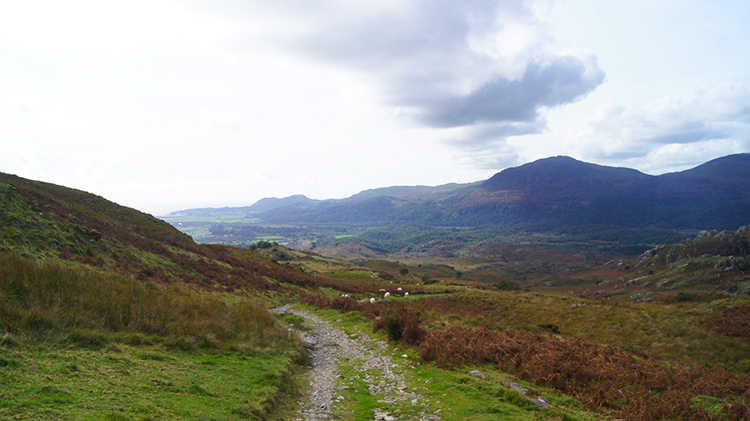 On that occasion I had headed east along Cwm Croesor and up Moelwyn Bank to climb Moelwyn Mawr. This time I headed north and straight into a steady ascent on a well maintained drovers path. 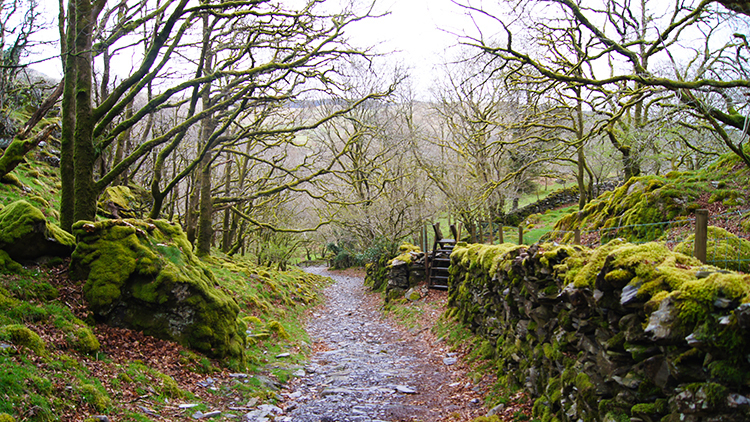 On either side of the path dry stone walls were heavily mossed over. So were the trees straddling either side of the footpath. They provided some shelter though I needed little on such a good morning. It was a chilly late September morning but the climb warmed me. 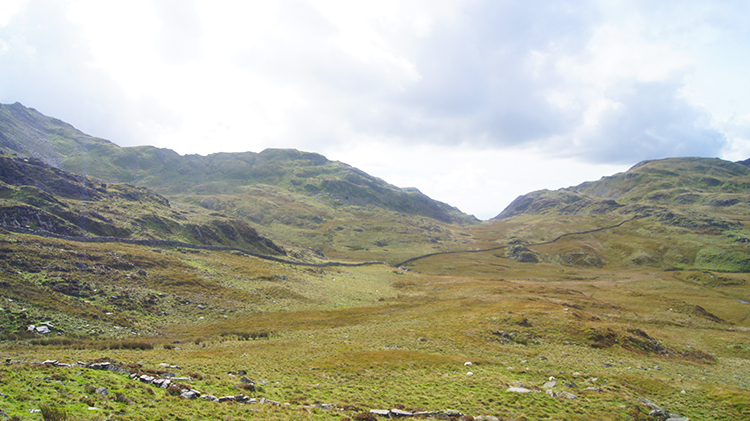 After 600 metres of walking on the enclosed path I reached a gate which would lead me directly towards Cnicht. I had climbed 80 metres. Just another 450 metres to the Welsh Matterhorn. When I had reached the gate leading me to the open high ground I had caught up with a group of walkers who probably had Cnicht as their immediate target too. I stopped for a couple of minutes to let them get a little further ahead of me and never saw them again. Which was strange as I was to make good time once I had resumed my walk. Perhaps they stopped for a break a little further on in some recess. They must have. 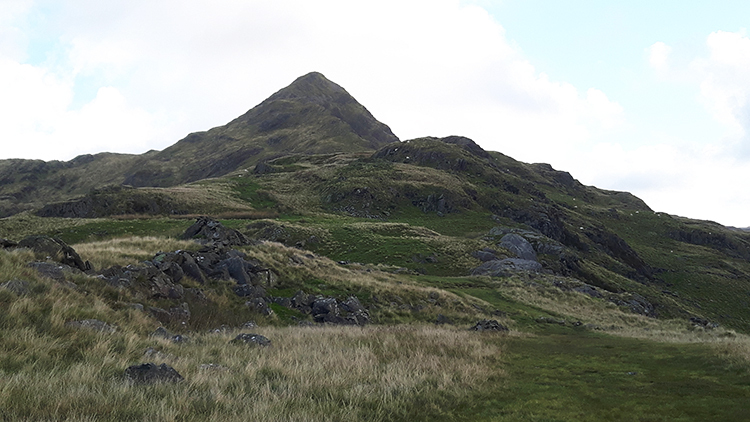 Anyway, once more in my chosen solitude with just me and the hills I continued along the path directly towards Cnicht which showed its distinctive pointed summit profile as a beacon. Drawing me in. 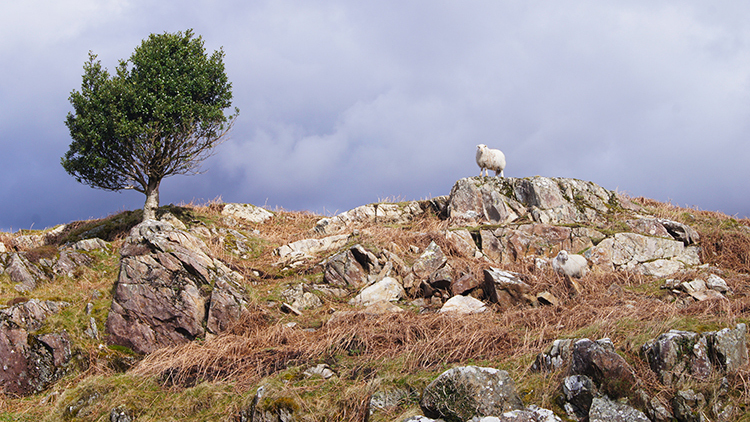 As I marched on, ever upwards, a sheep appeared on top of a nearby outcrop and watched me closely as I passed. Only the head of the sheep moved, the body stayed still, rooted to the spot. The climbing was steady throughout at about 1:6 gradient with around 150 metres of height gained in every kilometer I walked towards my summit goal. There was the odd variation such as that with a stiff kick up to a cliff outcrop as I approached the final climb of the distinct cone top. Once at the outcrop though I got a breather and as I rounded it a short slight descent on the gap between the two features of the immediate hill. On the level I braced myself for the final climb. The other walkers were gone now, the sheep were gone too. It was just me and the hill. As soon as I had steeled myself for the final steep part of the climb to the summit of Cnicht the sun came out. It had been promised but thus far it had kept its cover. Now it lit up the Matterhorn for me, urging me to rush up to the top. I could not manage a sprint, perhaps I could have a generation ago, but still I hastened my seventh decade frame into a decent scramble up the bank. Yes I paused here and there, puffing away the breathlessness before another haul up the cone. A gorgeous cone which was shedding its grass cover and revealing a rocky top as I clambered ever and ever further to the summit. And a cone which I urgently wanted to reach the peak of. A few more hauls and a few more brief stops later and I made it to the top. Just as a bank of hurtling clouds which were rushing across the top of the mountain had cleared away. The climb to Cnicht was done and it had been great fun. 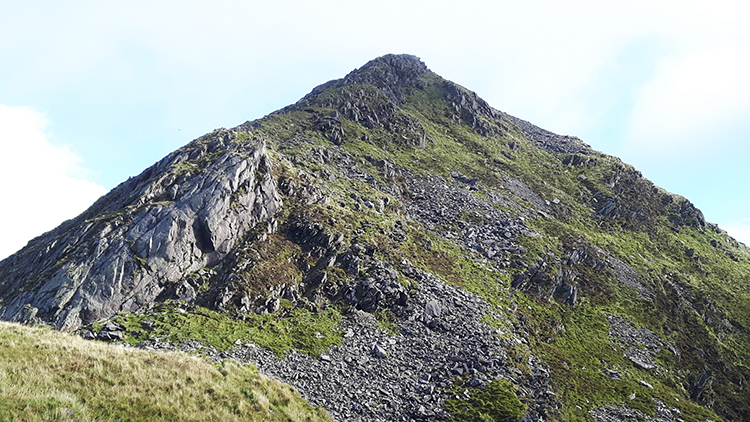 The final short scramble up the steepest of the Cone was a compliment to this shapely Snowdonia mountain which is fondly known as the Welsh Matterhorn. Cnicht shows the pyramidal form I had seen all the way up on my approach from the south-west and this aspect has earned the mountain the affectionate nickname of Matterhorn of Wales. Now I was up on the top of the cone though I saw Cnicht had much more to offer. 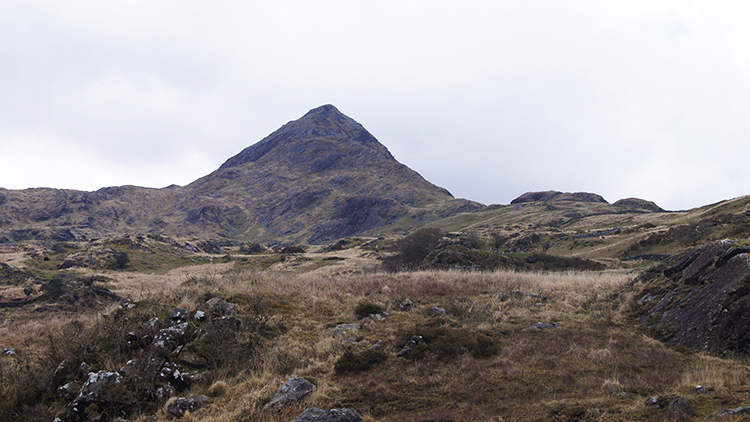 Now I could see the secret of Cnicht, a shapely 500 ridge line to walk along from south-west to north-east. Before I set off along the ridge though I stopped to take time and look south-west across Tremadog Bay. 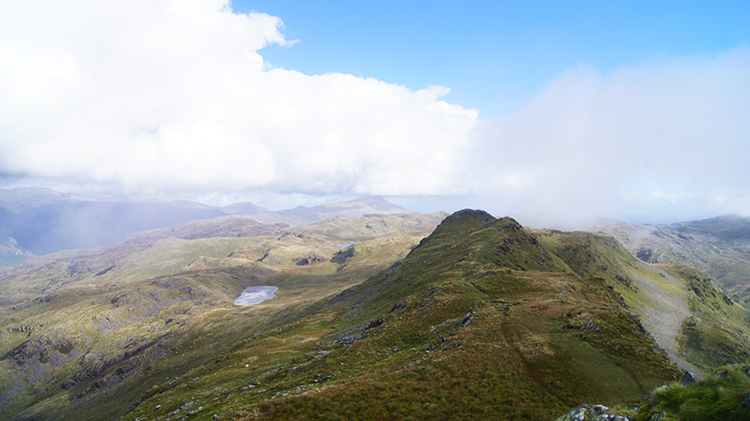 The wispy clouds crossing over Cnicht took the view from me and then returned it in equal measure. 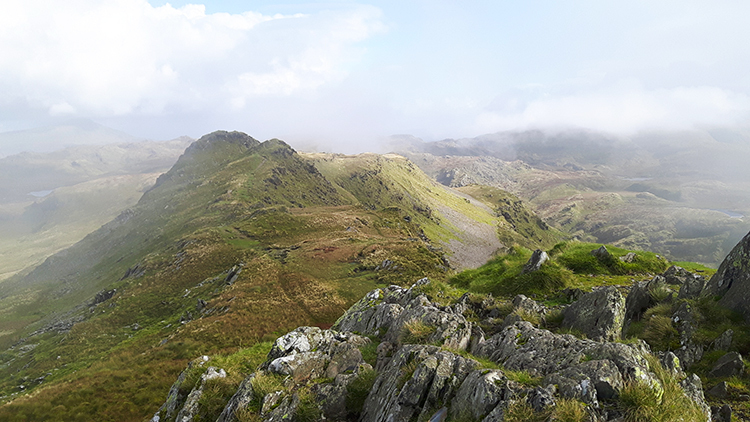 Having sampled enough gaps in the clouds to enjoy the Irish Sea views and indeed those across Cwm Croesor to Moelwyn Mawr I then enjoyed my stroll across the ridge of Cnicht. 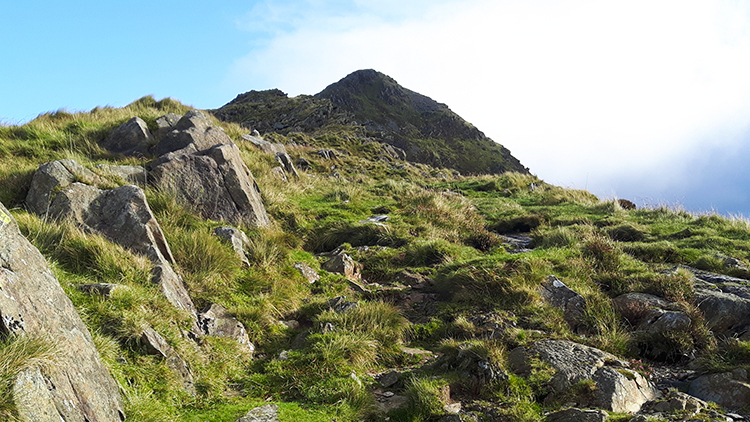 The run of cloud which had joined me on Cnicht continued to dissipate as I crossed the ridge and looked straight along the line which I would follow towards Llyn yr Adar. The uplands were widespread, bleak and gorgeous, all at the same time. The whole scene ahead of me looked totally inhabited and I ached to get down from the mountain in order to explore it. 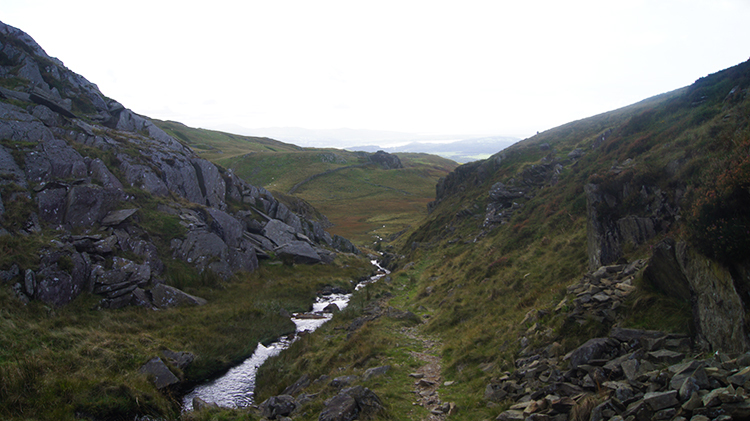 It was a simple task to do so, the path leading from Cnicht was clear and a good one at that. Though it does not appear on the paths be reassured. It is there and easy to follow. Moreover it is a lovely path to tread on, low grassed and sufficiently bouncy without giving. A walkers dream, at least for me anyway. 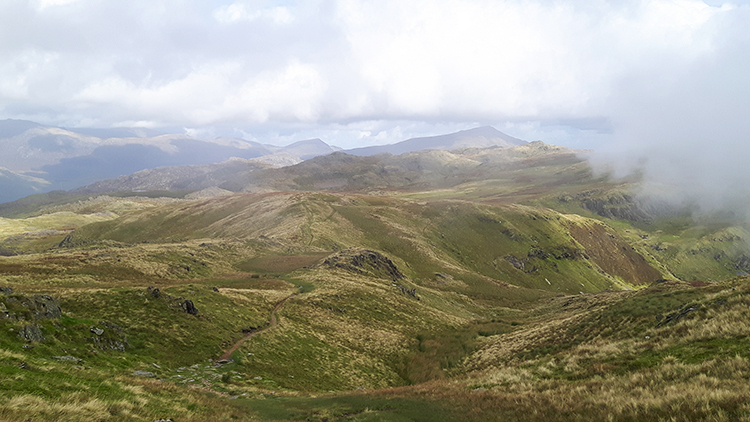 As I wandered down the path, sometimes skipping with joy, I looked north-west across the upland plains to higher mountains which included Snowdon, the highest of all in Wales. I bounded along and revelled for the next mile of my walk. Even though I had claimed and thoroughly enjoyed my time on Cnicht I still looked forward to more adventure. And the first attraction of new adventure revealed itself as I looked over Llyn yr Adar to an outcrop on the far side of the water. I spotted a very appealing cairn which is not marked on the map. I headed straight to the east side of Llyn yr Adar and then immediately up the outcrop to the cairn. Indeed it was a beauty. After I had climbed up to the cairn I parked myself up for my walking treat of crisps and chocolate bar. Altogether with a soft drink of course. 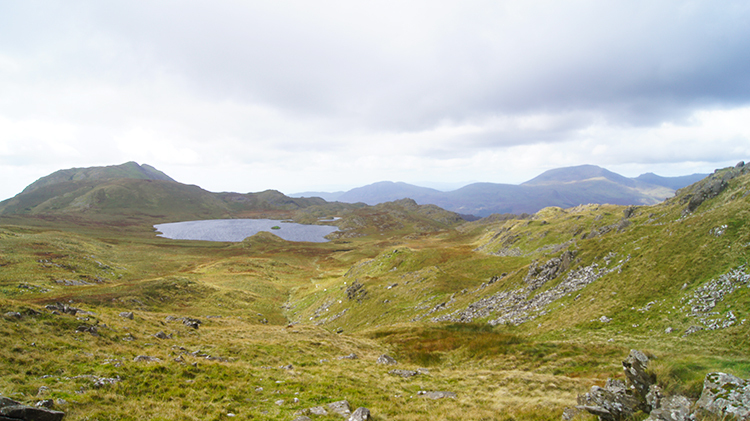 I enjoyed more exquisite views during my break, including one across Llyn yr Adar to Cnicht and then I resumed my walk. 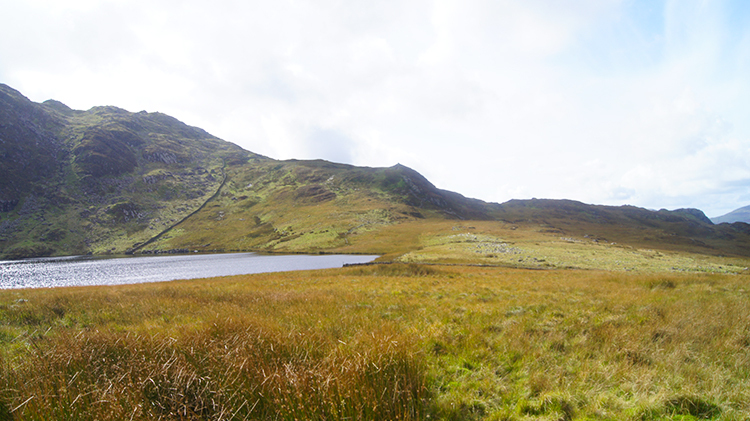 I followed the path shown on Ordnance Survey maps which skirts the east side of Craig Llyn-llagi. The hill acts as the barrier between Llyn yr Adar which I had just left and Llyn Llagi which I was now heading to. The north side climb down from Craig Llyn-llagi was the steepest part of my walk and had to be taken carefully. 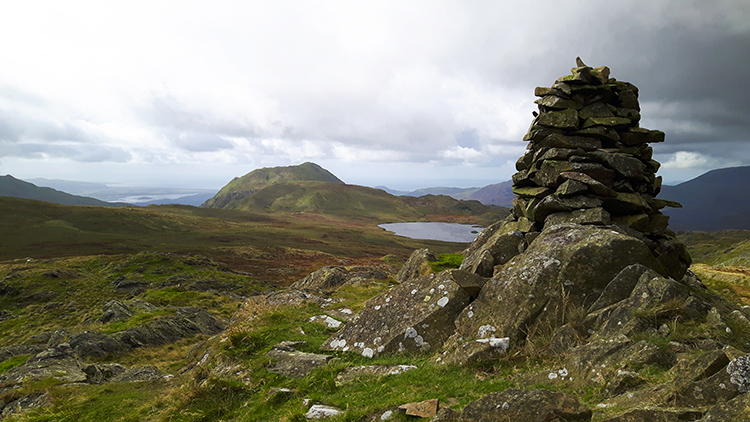 I made it safely down the steepest part of my walk, while doing so looking across to Llyn Llagi and trying to make out the site of an abandoned settlement on the north-west edge of the lake which I had wanted to explore. I could not make anything out from distance though and after crossing the bog in a series of snaking detours I could not make out any semblance of the settlement at close inspection either. 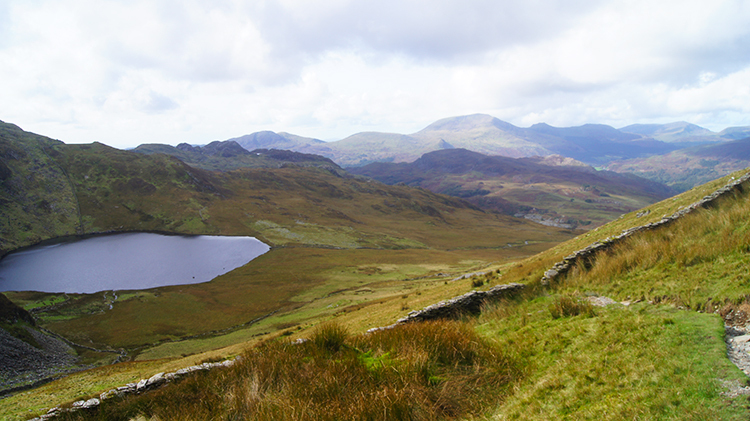 I contented myself with a short rest break beside Llyn Llagi while I worked out my bearing for the continuing walk. Now I was done with marked routes for a few miles while I crossed the untamed upland. My course was on a bearing near to true south-west for the next two miles over land between 300 metres and 400 metres altitude. There was no real climbing to do bar from the initial 30 metre climb from Llyn Llagi to the low pass east of Castell (Clogwyn Coch). Even a small climb of that nature was more challenging than normal though as I had to make my path as I went along, side-stepping small outcrops and hollows alike. It was immense fun though, I am an addict for adventure and this walk which had been super so far, albeit on mapped or clear paths, was now discovery over virgin ground. I guessed others must have been here before but not enough to make out a marked way. Drat, half way across my explore and just after cresting the top of the low pass I spotted a long wall barring my way. "How will I get over that" I asked myself. I continued on my unwavering line for a couple of hundred metres while thinking about whether I should scale the wall or work my way around the answer presented itself to me. There was a high six step stile. I need not have worried. 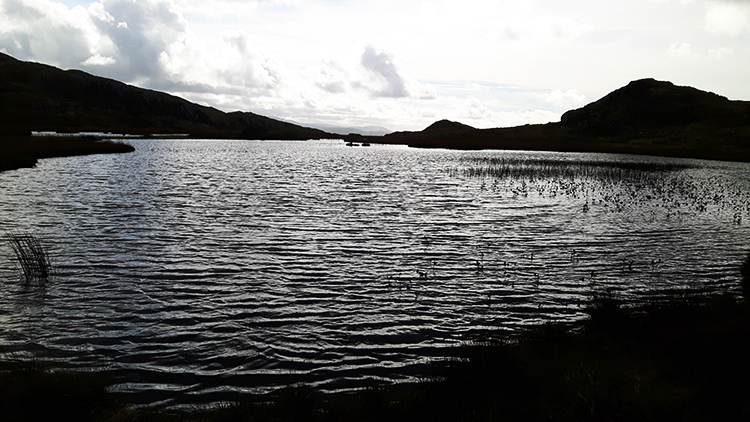 After climbing the stile I crossed the line of a path leading from Nantmor via Yr Arddu to Cnicht to reach a shallow lake which I have named the Dark Pool. It looked moody in its setting. A moody beautiful I imagined. From the Dark Pool I continued on my unwavering line first following a stream flowing from the pool and then on a path which was vague at first and then perfectly clear past the sites of disused tips and disused levels. At a point near where I had passed the sentinel sheep earlier in the day the path I was following merged my outbound path. 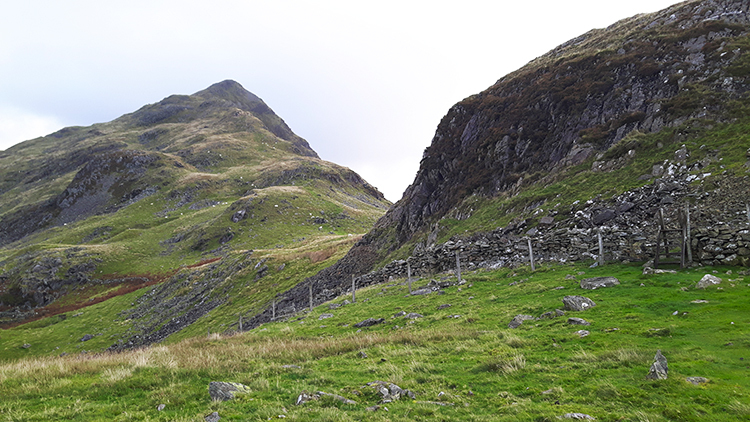 A straightforward walk to the gate where I had paused at earlier in the day followed by an amble down the moss walled lane led me back down into Croesor. My walk was done. 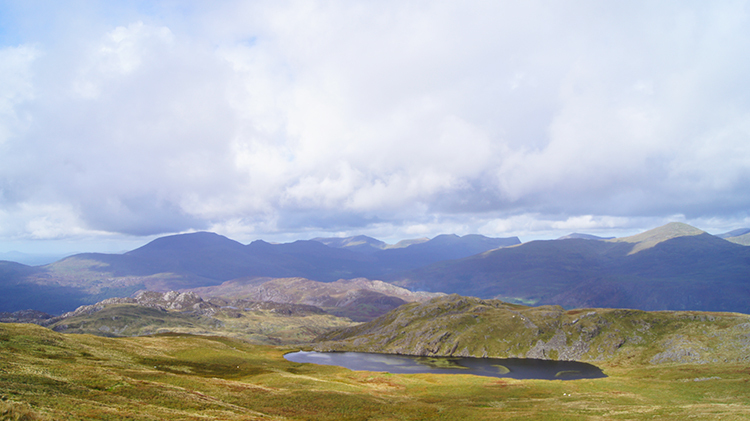 I had claimed my Matterhorn and I had walked across breathtaking Snowdonia uplands. I had adventured on unmade ground too during which I had to forge my own course. My conclusion: A cracker.